What's the coolest R/C car of all time? For many of us, RC cars were our formative experience in the world of cars. To some, it was an obsession. I once knew a kid who'd cataloged the entire Tamiya lineup in his head. What's the coolest RC car of all time? 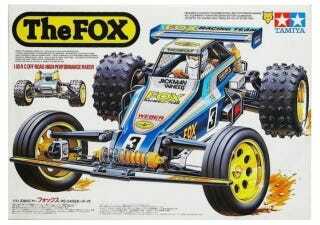 I don't remember how old I was when I first saw the Tamiya Fox. Whatever age it was old enough to be smitten instantly, and young enough not to be able to afford one. It was faster than hell, light, and could go practically anywhere. That included jumping onto the neighbor's cat via a plywood ramp. You?